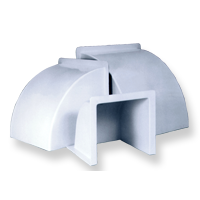 The 16″ fiberglass-reinforced plastic elbow is specifically designed to be used as a weatherhood that adapts to many fans. Plastic elbows replace many outdated or corroded metal hoods with smooth, non-porous Osborne RTM-Glas construction. Fits 16″ Osborne Slant Wall fans. Osborne fiberglass elbows do not become brittle in cold, like other plastics do, and does not heat-sag in hot temperatures.